So I'm trying to brainstorm my next cartoon, but as usual I'm a bit overwhelmed with cartoon topics. There's always the war, of course, and wacky racist Republicans, and the fact that thanks to Romney kids in poor Massachusetts cities are going to be in gigantic classes without any crayons or art class or music class while their peers in the suburbs merely won't have any new teachers for a while (see yesterday's Globe piece "Broken Crayons, Worried Teachers"). Then there's Powell's dissent on affirmative action, John Ashcroft's ridiculous attempts to "honor" Martin Luther King, Jr. by lying about his own record on civil rights, and Bush's announcing a "National Sanctity of Human Life Day" on the anniversary of Roe v. Wade--at the same time as he sends other people's kids off to get killed in Iraq. Ted Rall makes a point that everyone else seems to be neglecting--to have an informed opinion, you need... information. 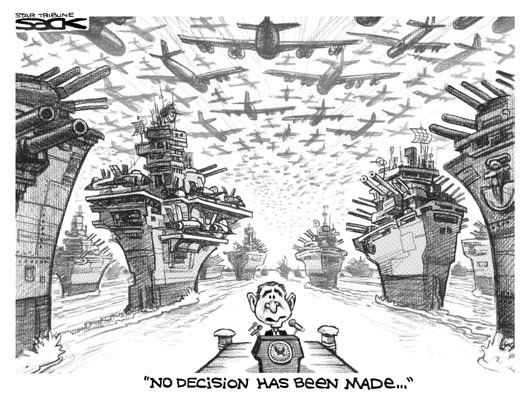 Steve Sack makes a nice visual comment on Bush's continuing insistence that "no decision has been made" on Iraq. ... a big thank-you. Much to my chagrin, I had to move out of my dorm room and could not attend.